Underneath the stylised writing heralding the brand within there is a vintage woman's collar with bow. This has been updated, but remains old-fashioned and maybe even condescending to Miss Vickie. Beneath this is a strong and boldly flavor color coded bag. There are just three colors, except for the little retro badge, that includes a cartoon style diagram. There is also a backdrop of the production plant. It all seems to be trying to do everything for everyone, but not hitting the mark in any category. As with most of Miss Vickie's Chips, these were particularly crunchy. They did not give up the battle to stave off their original potato mushy state too quickly. The oil soaking they received stiffened 'em up sufficiently to make a sustained firm crunch right till the final bell tolled. Or, without the mixed metaphors... They were crunchy! As you might expect, there were little black dots to break up the yellow color of the Chip surface. There were curly and odd shaped Chips, but not many. There was the tiniest amount of skin visible on some edges. Firstly, hats off to Frito-Lay for bringing us a flavor that should be welcomed more openly by the general Chips producing world. It is a classic combo that could be as familiar as Barbecue or Salt & Vinegar. To temper that, we spotted that a bag includes a staggering 19% of your recommended salt intake. However, the problem with the pairing, and presumably the reason why they are not as prevalent on supermarket shelves as more familiar flavors, is because they do not really mix up together. While a couple stare lovingly into each other's eyes before finishing sentences, these are most certainly separate flavors. 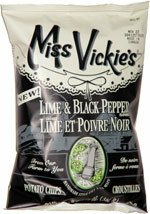 While the Lime was enjoyable, and the Pepper was enjoyable, they were different experiences in the same bag.